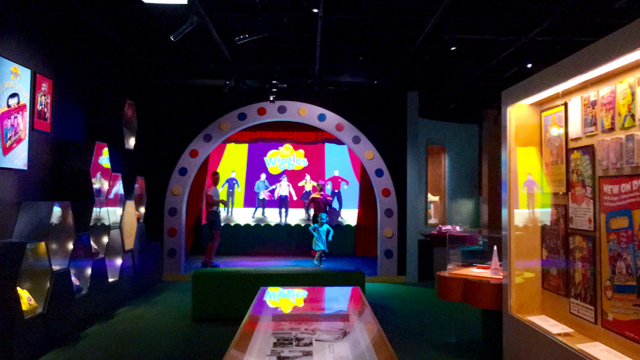 The permanent Wiggles Exhibition at the Powerhouse Museum in Sydney reopened a few days ago and we were very excited to see it. It was our first time at the Powerhouse Museum and we loved it! 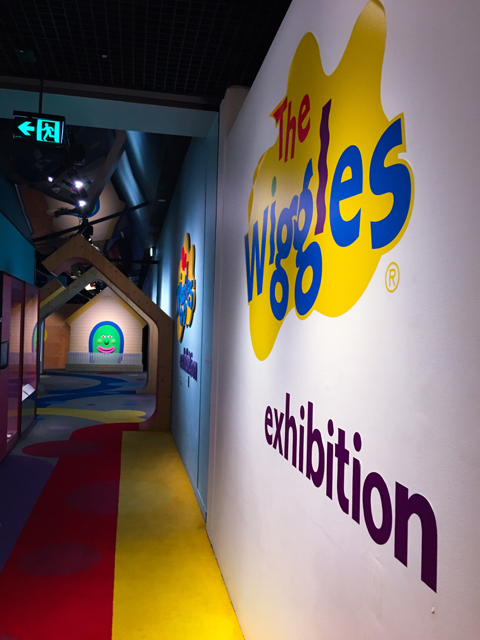 We did not know what to expect from the Wiggles Exhibition but it sure didn't disappoint and we spent a good time in there interacting and enjoying ourselves! Wiggles' favourite characters Dorothy the Dinosaur, Wags the Dog, Henry the Octopus and Captain Feathersword remain part of the exhibition however profiles of latest members Lachy, Emma and Simon along with some of their precious items and new interactive activities were introduced much to our delight. 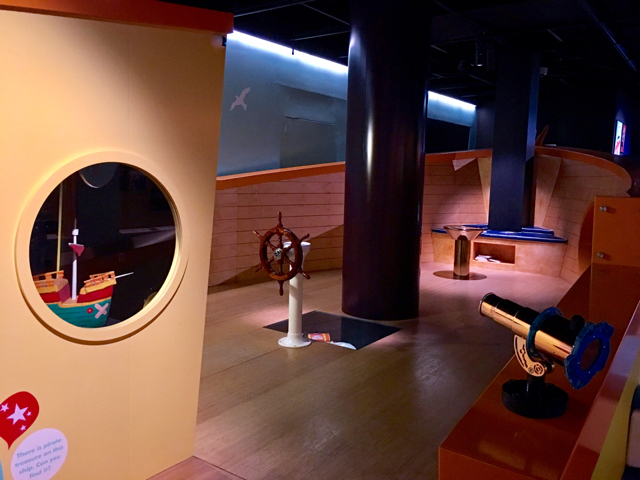 We loved looking around at the Wiggles books and toys collection, walking onboard Captain Feathersword's boat, reading a book and playing in the under 5's little corner with Mr 1. The Big Red Car also received an upgrade to incorporate messaging from the Transport for NSW on seatbelt safety featuring the Wiggles’ song “Are you Buckled Up.” Kids can also keep safe onboard Captain Feathersword's boat by using the life jackets provided. We loved the concert hall with memorabilia on each side and the little concert booth where kids and parents can dance and sing along to their favourite Wiggles tunes. We especially loved seeing gifts given by fans to Emma and Lachy and a few pieces from their wedding day - how gorgeous! 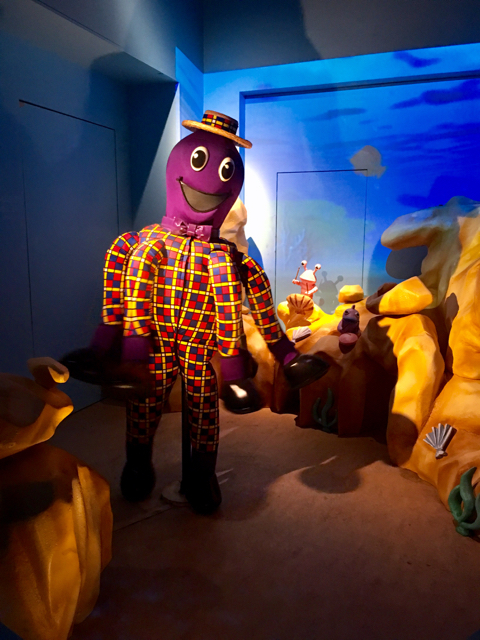 I was told that the setup of old favourites Henry the Octopus, Dorothy the Dinosaur and Wags the Dog is very similar where you can see Henry singing and dancing near underwater projections, Dorothy swinging on her swing and Wags relaxing in his house. I am not sure if this was previously incorporated but a station where you can make your own rose is near Dorothy as well as a picnic basket is included in Dorothy's house to share tea. We were happy to dance with these guys regardless as it was our first time and we made some nice roses and coloured some bows with Wags in the cute colouring corner. One thing for sure, there are new interactive spots for Emma, Lachy and Simon which are very colourful and filled with info about the performers and some of their special items. We especially loved Lachy's corner where kids can make a lightbox picture using colourful shapes provided in draws and on the desks. As well as Lachy's telephone tins where kids can talk and listen through with a friend. Mr 1 loved the lightbox whereas Miss 4 loved playing with the telephone with her dad. There's also two screens where episodes of Lachy's tv show are shown and where kids can draw using a touchscreen tv. Mr 1 loved colouring in using the touchscreen tv and wasn't keen on sharing it - ha! Last but not least, we made some good old' fruit salad at the station and played with wooden coloured shapes and interacted with the screen to make more fruit salad! 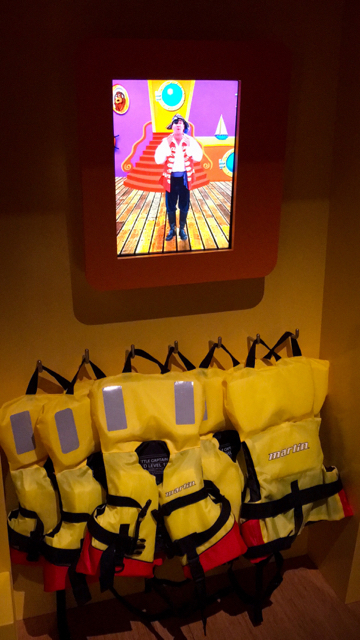 A big thumbs up to the new Wiggles Exhibition, we loved it and will be back again for more! We also visited parts of the Powerhouse Museum during our visit, played in the Egyptian Discovery Dig, visited Egyptian Mummies: Exploring Ancient Lives and made an Egyptian necklace as part of Egyptian Sundays but more info on that soon. For now - let's Wiggle! 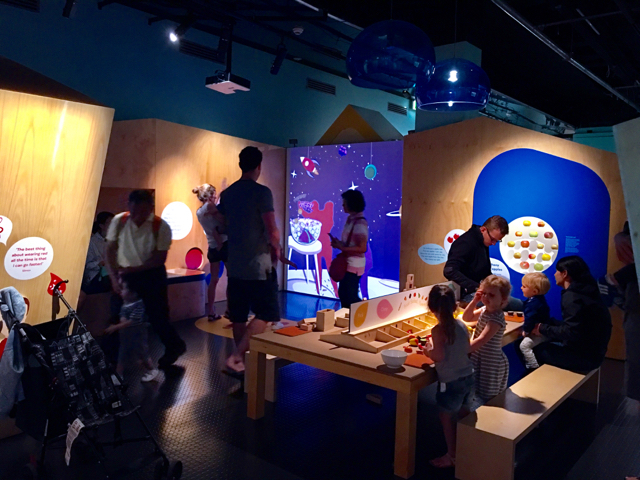 The Powerhouse Museum has toilets and change rooms on each floor with a parents room on level 2. We visited on a Sunday and headed to the Powerhouse Museum early to avoid the queues and used the entrance near the Café and playground. We parked at the Wilson Parking (adjacent to Novotel Sydney Central) on 179 Thomas Street, Haymarket. We paid the discounted rate of $15 per day after validating at the entry desk. The info is on the museum's website. It was pretty easy to park where we did as the parking had space and was a small walk to the Museum. 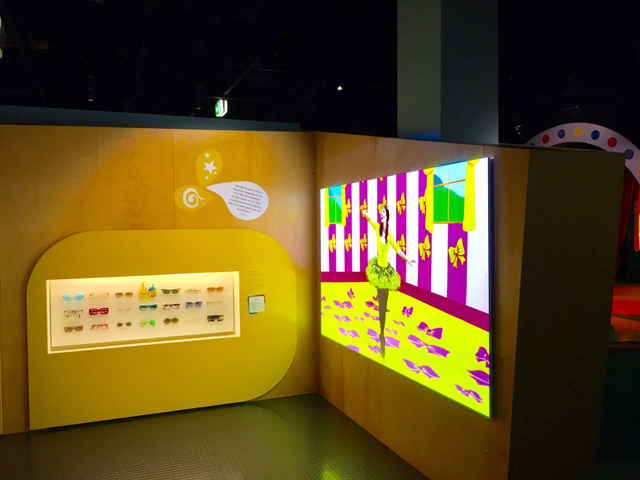 For more info on the revamped Wiggles Exhibition, head to the Powerhouse Museum's website.